The snow is falling softly outside, the winds have finally died down. I'm trying to keep my fingers busy knitting or sewing so I don't nibble at food all day. What is it about snow storms that make us want to bake? I must have had cupcakes on my mind because this little hat was the first of my creations. My new machine and I have been whipping out log cabin blocks. Before I put the green strips on, they look like Valentine blocks instead of Christmas. I love the cheery gingham! I have fifty of these to make and I'm pretty sure I will have that done today, that is if I stay out of the kitchen. I've already made the Pioneer Woman's chicken spaghetti and potroast so I wouldn't have to cook for the next couple of days, but goodness me, cupcakes sound delicious! This is the view from my back porch. We haven't even seen a snow plow yet. The storm is suppose to continue until seven tonight. I can't imagine what that amount of snow will look like, but I'm about to find out! I love the cupcake! We passed off the snow here in Illinois to you guys and my Sissy. Stay warm and keep playing! We are getting quite a bit of snow here in NH. School has been canceled today and was let out early yesterday. Love your log cabin squares. Hope you show the finished project. Looks like your new friend has been good to you! :) The gingham is darling!! As is the hat. And, aren't snowstorms supposed to make us hungry? :) I am craving soup! And coffee, of course. Stay warm friend. Those blocks are sew cute!!! gotta love a calorie free cupcake but the real guys taste so good! love your blocks, anything with red and I am a fan! I love your cupcake. Sooooo cute! Wouldn't that be cute on a pretty plate on your kitchen counter!! I just had a homemade cinnamon roll. I know what you mean about cold weather and eating. I love your cupcake, and your quilt. Very cheery colors to brighten your day! I hope you stay safe and warm and enjoy that new sewing machine!! It looks like you are...:) Have fun!! love the cupcake, renee. my girls are really enjoying all of the snow. they've built an enormous snow fort. 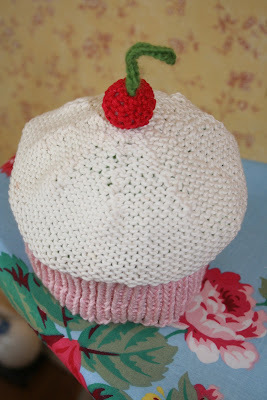 That's my kind of cupcake :) I totally love it and yes...Where did you find the pattern? Awe I LOVE it!!! Piper will look perfectly delicious in it;). You're awesome. And I LOVE the burp cloth idea! I hadn't even thought of that and yet, they are an absolute necessity! And I have a bunch of scraps left from all three of their blankets that I made for them. Hope you and the fam are enjoying the snow! They finally plowed our street this morning, crazy! I hope you all get some relief from the snow. And the sun breaks through!! I found your blog today and love it. The combination of wonderful pictures, scripture, family and your talent has made me become a follower and I know I will be visiting often. Thank you for sharing a part of your life with all of us. It had a wonderful calming effect on me as I browsed.